MY two favourite hot hatches used to be the Volkswagen Golf for its handling and performance and the old Honda Civic for its stylish looks. I say ‘used to be’ as that’s before I tried the Seat Leon. It’s a car that ticks all the boxes for me – it’s sleek, stylish and, as it shares most components with the Golf, handles brilliantly. 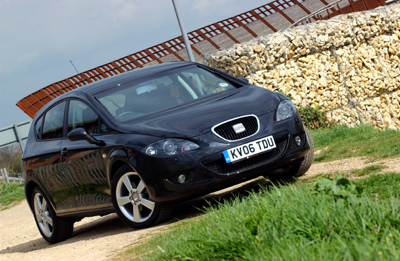 One of first cars I drove when joining Fleet News was the old Leon Cupra. I loved it and have fond memories but this one hasn’t disappointed so far either. Redesigning the Leon was a smart move. Some say bringing it in line with the rest of its family wasn’t very exciting but with its sleek front end, muscular wings and toughened suspension, I think it’s made a huge difference. The Leon is solid, rigid and stable – very similar to Golf – but considering it shares many underpinnings including the chassis, engine, gearbox and some interior trim, that won’t come as a surprise. Not only is the build quality of the Leon top rate but the handling is, too. It offers a sturdy ride and although steering is light there’s still plenty of feel as the Leon grips the road with precision. The 2.0-litre TDI Sport has extra sporty touches – but even with its brawny engine I’m still achieving 40.1 mpg. Our version has more than £2,000 worth of options. Thanks to the recent 30 degrees C heat I haven’t had chance to test the heated seats (£125) and luckily climate control is standard. But I have been getting to grips with others such as the rear parking sensors (£175) and electric sunroof (£310). From a driver’s point it’s great to have lots of little extras and I’ve grown particularly accustomed to the parking sensors – not because I’m a poor parker but because they make reversing much easier. So much so that I’d be tempted to pay the extra £175 to have them as an option on my next car. Jeremy Bennett, the Leon’s previous tester, complained of uncomfortable seats and an obscured speedometer but I haven’t experienced either of these problems. The only reason I can see is the fact that Bennett is 6ft and I’m 5ft so we have the seat positioned at opposite ends of the scale. He also mentioned that the front registration plate had come unstuck so we’ve booked the Leon in to the local Seat garage for a quick fix next week.